A unique and highly detailed fixed blade knife for the Freemason in your life! This full tang bowie knife is loaded with style from end to end. 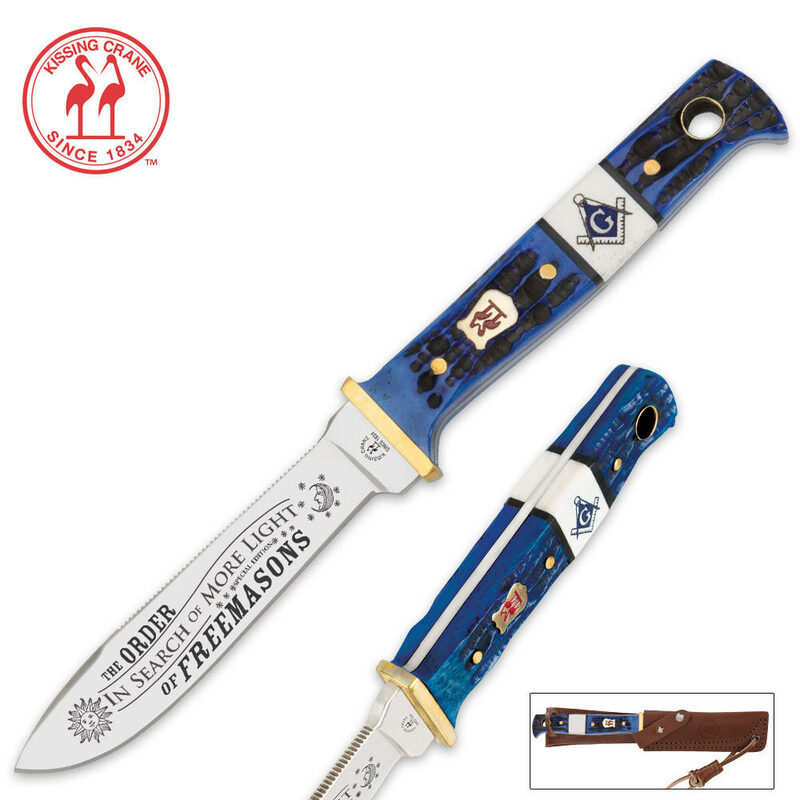 Features include a polished stainless steel blade with "In Search of More Light" etchings, royal blue genuine bone handle scales, and white bone handle accent with Masonic logo. This knife comes bundled with a brown leather sheath, complete with snap closure and belt loop. The sheath is designed for both style and function, making it a suitable addition to your Masonic wardrobe. Was impressed by the edge on this 440 and the overall craftsmanship. Only complaint is orgin of product. I expected great deal on german blade and got chinese. Quality does not appear to have suffered. Budk as always has best deals by a longshot. Great little knife. Very high quality. Nice thick leather sheath. I bought this knife to have as a ready Masonic gift for a newly raised Brother.When it arrived it was so nice I decided to keep it for myself!The craftsmanship is outstanding for such a moderately priced blade.Too,the included leather sheath is also excellent.Buy it! I like Kissing Crane quality, so when I obtained this product, I marveled at the craftsmanship. I use mine as a letter opener, for which it is the perfect weight and feel. But more importantly, it reminds me of my great grandfather, who was a leader of local masons in his community.